The e-commerce is developing rapidly all over the world, for the e-commerce sellers, there are a lot of potential market waiting to be tapped — as long as you know how to do it. Mainland China is one of the gold mines to dig. But when it comes to global shipping, the high logistics cost is an unavoidable issue. Choosing a bonded warehouse in the right location can reduce a lot of logistics cost. For the e-commerce business which aimed at China market, using Hong Kong bonded warehouse is a good choice. Building an order fulfillment center in Hong Kong bonded warehouses can help the e-commerce seller to expand business to mainland China with much lower shipping fee, taxes & duties, which gives the business a big advantage. China is the biggest e-commerce market in the world. In the year 2016, China has surpassed the USA to become the world’s largest e-commerce market. It is reported that there are over 200 million Chinese e-commerce shoppers who are spending about $40,000 per second. Selling in China is a good way to make more sales and create an international brand. Chinese consumers are very willing to buy foreign products. Because of the domestic food safety incidents and fake products are rampant in some C2C platforms, Chinese consumers more trust in foreign brands and tend to think that overseas products are more advanced. In this case, the foreign products selling in China can take the high-end route, and brings more profit margin for the e-commerce sellers. There are a lot of manufacturers in mainland China. As everyone knows, the manufacturing industry of China is very developed. Different from the factories in Southeast Asia, Chinese manufactures don’t only have price advantage, there are a relatively complete industrial chain in China. The e-commerce sellers can literally get one-stop service from Chinese manufacturers. Not only benefits from mainland China market, the e-commerce business use Hong Kong bonded warehouses can also get more advantages in following ways. Establishing a fulfillment center in Hong Kong brings the international brand image. As was mentioned above, foreign products can take the high-end route in China, but this is based on a good branding. Branding is a hard work in multiple aspects, it needs good customer satisfaction and brand image. Keeping products in Hong Kong not only draws a international brand image but also shortens the shipping time to mainland China, which will definitely delight the buyers. Not only that, if the e-commerce seller wants to further improve the customer satisfaction, he/she can partner with an order fulfillment company in mainland China to deal with refund, exchange and customer service for him/her. Bonded warehouses generate much lower taxes and duties. For example, if the e-commerce seller sends the goods to mainland China directly, he/she has to pay taxes&duties for all of the goods, sold or not. 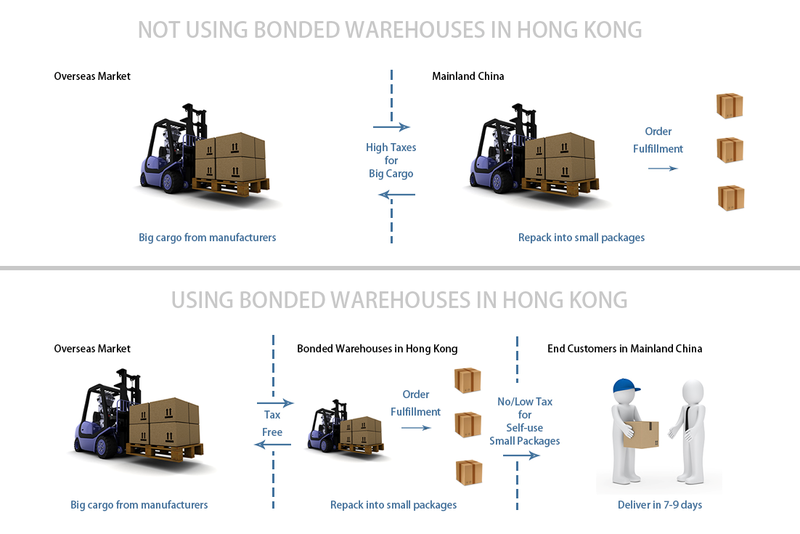 But if he/she uses the Hong Kong bonded warehouse, he/she can only pay taxes for the sold products before they are shipped out. Stocking the goods in Hong Kong makes the shipping more flexible. Hong Kong is a transit hub in global shipping, which plays an important role in global e-commerce. Using bonded warehouses in Hong Kong makes it possible for e-commerce sellers come up with more flexible shipping solutions and save more logistics cost.